IT management encompasses many functions, such as needs assessment, proposal development, site preparation, network cabling, hardware installation, software configuration, network administration training & network administration. Ensure that your network and communication systems function properly through monitoring of servers, routers and network devices for general connectivity and process-level functions such as disk space, e-mail, tape backup and Internet function. Replace outdated hardware and software. Reduce downtime through preventative maintenance and troubleshooting. Diagnose, troubleshoot, configure and make your system more efficient and productive by analyzing your business needs. Often, IT challenges require technical competence beyond the scope of current management; yet the demand for a full time IT specialist or department is simply not there yet. So what can smaller companies do to get the same advice and expertise as larger organizations do? Today, many companies outsource part of their IT functions. Rather than maintaining comprehensive in-house staff, they hire an IT company and are able to utilize the extensive knowledge of various IT specialists and then only pay for the services they actually use. It wasn’t long ago that primarily the GMs, 3Ms and IBMs of the world practiced outsourcing. These days, as companies of all shapes and sizes seek to reduce costs, smaller firms are discovering how outsourcing can be a cost-effective way to remain competitive. By the time you factor in labour, taxes, paid vacations, bonuses, insurance, office space, support personnel, a computer, software licenses, a mobile phone, Internet access, a $50,000 a year salaried employee can easily cost a company upwards of $100,000. And don’t forget to tack on the added expenses involved with recruiting, training and retaining employees. Currently, companies worldwide spend more than $1 trillion a year on outsourcing – a figure that is growing by 20 percent annually. Outsourcing allows companies to reduce overhead expenditures, increase speed, flexibility and response times, and improve organizational efficiencies. By leaving the IT functions to professionals that are fully trained on the latest technologies, companies can use their internal resources more efficiently, receive 24 x 7 support and reduce financial risks. Forvan Technology Services Inc would be pleased to help you determine if outsourcing will be a benefit to your organization. Please contact us today for a FREE consultation. With hundreds of viruses being released each month, companies of all sizes can easily be crippled without adequate protection. Malicious programs such as viruses (and their counterparts, worms and Trojan horses) can delete or change files, consume computer resources and even allow outsiders to access your files. Yet the worst part is that they can replicate (or copy) themselves and harvest Email addresses from your contacts list. So once your infected you can easily contaminate your internal system as well as customers, suppliers and anyone else you deal with regularly through email. Make sure every company PC, server and laptop is fully protected. Most infections start when a user unknowingly opens and runs a virus-embedded Email attachment. Users are lured into opening and running these programs through enticing or deliberately misleading messages. Viruses are also embedded in Web pages and in Emails formatted to look like Web pages (HTML-formatted Emails). Embedded viruses simply execute when the page or Email is viewed, and users often have no idea what’s happening. Never Open Suspicious Files: Everyone needs to understand how important it is to delete (not open) any files attached to an email from an unknown, suspicious or untrustworthy source. Use Email Security Features: Familiarize yourself with your Internet settings and adjust your security so it will help block potentially infected Email. By incorporating these tips into your security practices you will help your business to reduce the threat that viruses, worms and Trojan horses can have on your system and data. Forvan specializes in virus prevention and removal. We offer a free consultation that will quickly identify your needs and explain how you can create a safe and virus free environment. For more information please review our services or contact us today! Backups are extremely important for every computer system. With the increased threat of hackers, viruses, natural disasters and even theft, your backups may end up being your ultimate saviour. If you’re like most people, you’ve probably invested a lot of time getting your system how it is today. Not only does your system contain all the documents you’ve created, but think about how you’ve organized your system and the way you’ve set each software setting. Without reliable backups your entire system could be lost in one foul swoop. With properly planned and organized backups you’ll rarely lose an important file; have to re-type or recreate data or reinstall all your software from scratch; but most importantly, you’ll never have to say “oh no” and kick yourself after deleting something important. Good backups won’t let you down and if your system becomes unstable or corrupted, they will allow you to easily restore a single file, or restore your entire system and bounce back to a pre-problem state. But today, with software quickly gobbling up our hard drive space, the best backup solution is one that is customized for your individual needs. A backup system that doesn’t fit your style of working, or that takes too long, or is too expensive, or gives you any reason to avoid using it, is pretty well worthless. Create a backup system that you’ll use! Answering who, what, where, when and why will help you to create a backup system ideal for you! You already know the “why” so let’s move onto the “who”. Assign the backup responsibility to a specific person. We often see smaller companies forgetting to assign this responsibility and only when things go wrong is it often addressed. For disaster recovery purposes, attempt to backup the entire contents of all drives. When purchasing a new server or upgrading an existing server, be sure to consider a backup drive that will grow with you and meet your needs for the next 3-5 years. If backup space is limited, a unique location, such as “MY DOCUMENTS”, should be specified on all workstations. If all documents, data & email were stored in this folder, it can then be redirected to the server for regular backups or to prevent data loss. All backups should be created and stored on media that can be removed from your facility. We recommend that you keep the latest backup(s) of your data in your local facility, then store an additional copy or even the previous backup in a remote location, (e.g. another building, offsite or even at home). You will need to cycle these tapes as necessary before and after each backup is done. Any strategy that you adopt should be documented and a detailed log should accompany the backed up media. Your log should include; a list of data, the backup date and which media was used. If you take the time to create a detailed log, your backups will be much easier to work with should a recovery be necessary. Data can be destroyed by system malfunction, accidents, disaster, or intentional means. A good backup cycle will allow data to be readily recovered as necessary. Systems that have mission critical data need to be backed up on a daily basis to minimize the exposure to loss of mission critical data. A good backup cycle includes a daily, weekly, and monthly rotation (aka grandfather, father, son). This will provide the capability of going back to a set period of time, and recovering reasonably up-to-date data. Backup routines can easily be automated with the right combination of hardware & software. For most companies these routines can be setup to run overnight during off-hours. For companies running 24×7, an open file agent can be used to allow for backups to be completed at any time. a) Tape Backups: Tape backups are very popular. The tapes hold several gigabytes’ worth of data, which means you could conduct a completely unattended backup of a large hard drive. Just plop a tape into the tape drive, start the backup process, and if set up correctly, you could walk away from the computer and let the backup complete on its own. If you want to perform backups with tape, you need to use a backup program that is compatible with tape. For example, PowerQuest’s Drive Image, and Avantrix Backup Plus, are not compatible with tape. However, many excellent backup programs, such as Veritas Backup Exec & Dantz Retrospect, are compatible with tape. Most tape units come with their own backup software. b) Recordable CD’s: Recordable and Rewritable CD’s, otherwise known as CD-R and CD-RW, let you make your own CD-ROM disks, which you can use to store valuable data, or backup your hard drive. CD-R discs are sturdy, reliable, and extremely affordable. One CD-R disk can hold up to 700 MB of data, and they are extremely inexpensive. This makes it extremely easy, and highly cost-efficient, to store or distribute large quantities of data, such as scanned images or sound files. You can even create your own audio CD’s if you’d like. The actual CD-R and CD-RW units themselves are now very affordable. A super-fast, high-quality unit can cost under $100.00 these days. In order to automate this process an additional software suite may be required. c) Recordable DVD’s: DVDs can easily store as many as 7 CDs, you could back up 4.7GB to a single DVD. Using DVDs instead of CDs will speed up large backups considerably and will also greatly simplify storage. A DVD-Writer can be purchased for under $300.00. In order to automate this process an additional software suite may be required. d) Web-based Storage: With web-based storage, you can upload files you want to store, and they are housed permanently on these sites. Using one of these sites can be advantageous if you plan on being on the road. If you need a file, and forgot to bring it with you on a floppy or some other form of backup, you can simply access your storage space via the web and retrieve it. These on-line storage sites are not intended for full backups. After all, you’d need to have Internet access to go to these sites, and that means your operating system and web browser would already have to be installed on your computer to do that. Therefore, on-line storage sites are designed more to be an extra means by which you can store valuable data. e) Second Hard Drive: You can backup to a second hard drive on your computer. However, we do not advise backing up solely to a second hard drive. We believe that removable media stored in a secondary location is extremely important otherwise you’re limiting your protection. For added peace of mind simply choose a backup system that will work best for you and commit to backing up your system on a regular basis. We can never avoid all threats. Hackers, viruses, natural disasters or even theft can randomly hit us all. It’s so important to have an up-to-date backup system that will capture your critical information. With properly planned and organized backups you’ll rarely lose. Forvan Technology Services Inc would be pleased to help you create a backup strategy that can protect you. Please review our services or contact us today! As businesses gain more access to the Internet as well as other business partners, the number of security intrusions is bound to increase and as hardware and software becomes more complex, the possibility of security breaches is unfortunately a reality that we all need to face. In order to prevent unauthorized access, especially to critical systems and sensitive information, begin by making “security” a top priority and allocate the responsibility of maintaining and monitoring your system to a reliable and knowledgeable person or IT company. Security is so intense, it really requires specialists, but here are some tips that can be implemented that will help you to secure your system. A simple way to avoid serious problems is to regularly update your software. Hackers like to find and exploit bugs and loopholes in popular software products. Some do it for money, some to make a statement, some simply to cause trouble, so if there’s a patch available, install it and spoil their fun. When you update software it “patches” the loophole or bug that the hackers exploit. Most companies use passwords to confirm identity and protect sensitive information, however in most cases these passwords are not used effectively. Many are weak and rarely get changed; often they are written down and posted next to the computer or on a calendar. It’s best to educate your employees on the importance of their password and how to create a secure one. Also, set a schedule to change passwords regularly. Viruses, Worms and Trojan Horses are malicious programs that run on your computer, they can delete or change files, consume computer resources and even allow outsiders to access your files. Virus-infected computers can spread throughout your company and cause serious downtime and data loss, virtually crippling a business. Every business should consider a firewall, as it will block intruders from getting in. Without a firewall and an “always-on broadband connection”, your company’s computer is vulnerable. Once hackers discover a valid computer address, they take advantage of vulnerabilities in software or try to crack passwords. Eventually they can gain unlimited access to networks and individual machines. A “Hardware Firewall” will block all disallowed traffic between the Internet and your network and in most cases also hides the addresses of the computers behind your firewall, making them virtually invisible to others outside. It looks for viral signatures by scanning incoming Emails as well as files already on your computer. If it finds a virus, it deletes or quarantines it. All antivirus software must be updated regularly, as hundreds of viruses are released each month. Look for software that automatically downloads the latest definitions and program updates from the Internet. Everyone needs to understand how important it is to delete (not open) any files attached to an email from an unknown, suspicious or untrustworthy source. Familiarize yourself with your Internet settings and adjust your security so it will help block potentially infected Email. Unfortunately your employees can cause serious damage as well as outside intruders. Malicious or deliberate attacks can be discouraged with added security to your physical environment. Create and enforce policies that protect your business information and assets. Often a casual break-in can be more damaging to a business than an unknown intruder who attacks via the Internet. Scheduling regular back ups is a vital part of security. It will allow your business to get up and running as quickly as possible. Computer downtime will eventually cost you money and good backups will minimize your risk and keep you operational. Creating a company-wide Internet usage policy is a wise security practice. While browsing web pages can be extremely useful, many contain programs that are questionable, or even malicious. These types of sites can profile your usage, install Spyware on your computer and even send destructive worms that can enter your system through your Web browser. Wireless networks are more vulnerable than cabled counterparts. They use a radio link instead of cables to connect computers, so anyone within radio range can in essence listen in or transmit data on a wireless network. Freely available tools allow intruders to “sniff” for insecure networks. To protect your wireless network, make sure all the configurable encryption and access control security features are active. Creating a designated team responsible for security will ensure that your system remains as secure as possible. You should clearly identify who’s responsible for security; identify the sensitive information and systems critical to functioning; consider all relevant security laws and regulations as well as the ethical standards of the company. Don’t forget to ensure that the recourses are available to establish and enforce the policy. For some companies remote network access is a business necessity, but if it’s not set up properly it can also be a security risk. Make sure your remote access carefully considers your security needs. You may want to incorporate a VPN (virtual private network). It’s one of the most secure ways for remote connections, as data is encrypted as it travels and users are authenticated in order to connect. By incorporating these 12 tips into your security practices you will help your business to prevent unauthorized access as well as protect your system and data. Forvan Technology Services Inc specializes in security and would be pleased to help. We offer a free consultation that will quickly identify your needs and explain how you can create a safe and secure system. For more information please review our services or contact us today! Ongoing maintenance is required for every computer system and by putting in a little maintenance time every week; you will ensure that your system operates as efficiently as possible. Preventative Maintenance will limit any day-to-day network issues, minimize Information Technology costs, and reduce the time needed to accomplish tasks. Depending on your requirements, as little as one hour per week will help maintain a solid foundation for your technology infrastructure and help you to prepare and plan for future needs. In today’s world, IT is fundamental to all businesses and should be maintained regularly by experienced professionals. Regular maintenance is vital; it will help you to identify critical errors and allow immediate response to eliminate or limit potential downtime. Regular maintenance will help you catch virus or virus outbreak threats and allow you to react quickly to secure your system. But most importantly, regular maintenance will put you in a proactive position so that you’ll be forewarned about any issues facing your system. Forvan Technology Services Inc is equipped to handle all of your maintenance needs in a cost effective way. Every company has different preventative maintenance requirements. We’d be pleased to handle the maintenance functions for you or help you to create a maintenance schedule that will keep your network and systems running efficiently. Please contact us for more information! Application programs have become an important part of today’s business environment and should be perceived as a strategic asset to your organization. Forvan Technology Services has a wide area of expertise in the installation, troubleshooting, and maintenance of many industry specific and mainstream software applications and operating systems. Forvan provides upgrade support services to assist clients in loading new databases, tools and software releases. As more software works together in an integrated fashion to provide the technology environment necessary to support day-to-day business operations, there is a critical need for these products to be appropriately tuned and aligned to optimally perform. Forvan’s performance enhancing services evaluate current configurations, demands, capacities, and utilization; identify future requirements; and suggest solutions to increase the responsiveness or capacity of the client’s network and systems. Choosing the wrong software application packages for your business can be detrimental to the long-term growth of your business. Many businesses settle for products that only achieve a percentage of their actual requirements; this puts extra burden and time constraints on employees, leaving room for costly mistakes. Forvan can assist companies in creating a needs assessment and recommend products that meet all your business goals. This includes compatibility research and integration testing to make sure that the introduction of new software will not create any problems. At times customized programming may be required, Forvan has several strategic partners that specialize in custom programming, database creation and web development. The operating system is the most important program that runs on a server or workstation. Every system must have an operating system to run other programs. Operating systems provide a “software platform” on top of which other programs, called application programs can run. The application programs must be written to run on top of a particular operating system. Your choice of operating system, therefore, determines to a great extent the applications you can run. Dependable operating systems will help you keep your business information secure and accessible. Forvan Technology Services Inc would be pleased to review your applications or operating system needs and identify areas for improvement. Please contact us today, for a FREE consultation. Forvan will provide and install all hardware components, system & servers required for your new or existing network. This includes cabling, network interface cards, hubs, routers, switches and wide area networking devices. The proper selection of networking components is an investment in your companies’ future. Components should be reliable, scalable, and compatible and have the best price to performance ratio. Forvan will custom build systems & servers or purchase brand-name equipment direct from the manufacturer on our customer’s behalf. Forvan is not vendor specific & has strategic partnerships with some of the largest distributors in Canada. Forvan will assess customer needs & make recommendations accordingly. Forvan support professionals will assist you in the maintenance and installation of system hardware. Forvan support professionals are technically capable and abreast of technological changes that are occurring on a daily basis. Troubleshooting is just part of our everyday activities. We address each problem with a background of experience and training, following time proven steps to determine what the problem is and what caused it. We will fix the problem and make recommendations to implement steps in order to prevent the problem from occurring again. We provide a written report within our invoice on the problem, outlining the steps we used to resolve it, so you will have a record for future reference. We can troubleshoot your problem quickly, minimizing down-time. Forvan will always provide an honest opinion on whether equipment should be replaced or repaired. Please contact us today, for a FREE consultation. With over 43% of companies now outsourcing their IT functions, remote support and monitoring has become a valid consideration for many companies. Forvan has the ability to monitor real time information about your servers and network conditions allowing us to instantly know when an issue has arisen. Sometimes we will be made aware of a problem before a user experiences any down time. We will notify you of any issues so that immediate action can be taken. Forvan connects via secure remote access to your network, servers and PC’s making it possible to instantly ascertain the status of operations and troubleshoot a problem anytime. With a remote connection, the efficiency and effectiveness of support substantially increases. By using remote support tools, a technician can begin troubleshooting a remote desktop, immediately. Remote monitoring will minimize downtime, increase response time and reduce costs by eliminating unnecessary site visits. A team of Forvan professionals can diagnose and repair problems quickly and easily. With technology becoming so specialized these days, companies can quickly access the vast knowledge and skills from all Forvan employees. We’d be pleased to discuss your needs and recommend solutions that are best for you. Please contact us today, for a FREE consultation. Providing information and support to employees that work out of the office can often be challenging. Many businesses now have to think about global markets and logistics, and to be competitive, companies need to be where their clients want them, when they need them. Organizations need to make sure their mobile employees are properly equipped and trained to take care of those clients or in the long run, someone else will. In some cases owners and managers do not have a good understanding of all the tools necessary to make the travelling professional operate effectively. Mobile employees must be able to connect from any location and have the capabilities of working remotely. Some common tools would include, the portable computer or laptop, and hand-held PDA’s (Palm Pilot, Blackberry, or iPAQ). Often mobile employees require both – a laptop for doing regular production work and the PDA for organizing and scheduling. In addition, mobile employees will also carry cellular phones or pagers that allow two-way email. With the right connectivity resources in the main office, mobile employees can access company resources as effectively as being back in the office. Although having the right tools is important, employees must also have an understanding of the different connection technologies and should plan for an alternate connection if necessary. With widespread company facilities, mobile employees, and home offices, a way to maintain fast, secure and reliable communications is vital. Many companies are now creating their own VPN (virtual private network) to accommodate these needs. A VPN uses a public network like the Internet, to connect remote sites or mobile users together. However it uses a “virtual” connection instead of a dedicated connection such as a leased line. Basically, VPN is routed through the Internet from a company’s private network to the remote site or mobile employee. When using VPN, companies should create security standards. Compression and size of data transfers also becomes important as delays and failures when transferring data can distract users and negatively impact productivity. We appreciate that mobile connectivity may sound complex, but supporting your mobile employees is easier than you think. 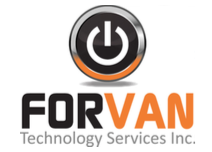 Forvan Technology Services Inc would be pleased to discuss your options and guide you in the right direction, please contact us for more information. Uncontrollable threats have become a real eye opener lately and many companies are putting serious consideration into a disaster recovery plan. The best time to respond to a disaster is before it happens and while planning for contingencies is never a cheap process, it certainly doesn’t have to break the bank. A relatively small investment of time and money now may prevent severe damage and disruption of life and business in the future. What if the worst happened, how would your business be affected? Would your business survive if it were closed down for weeks or even months? What could you absolutely not survive without? What if there was a prolonged power outage? What power backups are available? What if your key suppliers or shippers were shut down? Where will you store your backup information? What if the local phone service were disabled? What steps have you taken to ensure users will be able to access systems as soon as possible? Have you assigned key responsibilities to your Disaster Recovery team? How does your help desk fit into the disaster recovery plan? Does your organization’s disaster recovery plan address communicating with end users to keep them in the loop? Have you discussed Disaster Recovery plans with other departments in your organization? Is your insurance adequate to get your business back in operation? Do you understand what is covered and what is not? Can you pay creditors, employees, and your own needs during a prolonged shutdown? Remember, the key to a good Disaster Recovery plan starts by understanding your current state, reducing your risks, and planning for effective recovery. Ensure your disaster recovery and security plan is thorough, proven and most of all, ready when you need it! Forvan Technology Services Inc specializes in helping businesses plan for disaster. We would be pleased to help. For more information please contact us today! Use technology effectively to further your mission. The technology planning process can expand your horizons and help you see new ways in which technology can further grow your business. Buy the right equipment. Purchasing hardware, software and networking equipment can be overwhelming. If you don’t plan, it’s easy to end up with something that is way too complicated or doesn’t do what you need it to. Save money. You probably do not need the fanciest system on the market. Planning allows you to figure out how to spend less and still meet your needs. Avoid crises. Bad technology decisions can leave you suffering for years. A faulty system can send your stress level through the roof and make you lose crucial data and capabilities. Use staff time more effectively. How many hours of staff time have you lost to those irritating technical problems? A technology plan will help you streamline staff use of technology, and put systems in place that will make technology a useful tool for staff, not a stumbling block. Protect yourself from staff turnover. If the person who knows your technology leaves, what will you do? A technology plan can save you by providing documentation of existing systems as well as future. Technology planning is also important if you are changing locations. Many companies use their move as an opportunity to upgrade or replace systems with new technology, as it allows for the new equipment to be installed and debugged in the new facility while the existing equipment can be used up until the move. Other than planning, time is the biggest factor for successful system relocation. A greater challenge occurs when a company is planning to move a system from the existing facility to the new one. Under this scenario, time is limited and the company needs to identify when to make the transition from one facility to the next. Most often it will be done overnight, on a weekend or even during a shutdown. A smooth transition of your computer systems and local area network (LAN) between facilities will ensure continuity and prevent any data loss, as well as minimize your company’s downtime. Depending on the sophistication of your network, your vendor or consultant may be comfortable with your mover relocating the equipment. In these cases, verify that your mover has experience in handling computer equipment and devices. More often, computers and peripherals should be moved by the vendor or consultant who will be restoring and debugging the system after the move. Your in-house systems consultant, responsible for maintaining the computer and LAN systems can be a big ally during your move. This person should be an integral part of the relocation and on-site or on call during the actual move. To prevent costly mistakes, bring this person into the process early, and keep them involved every step of the way. Lastly, consider developing a disaster plan or “worst case scenario.” Although it is unlikely the plan will ever be used, your disaster plan, if needed, could mean the difference between a minimal loss of productivity and a major disaster. Keep track of all equipment cables, power cords, and phone wiring. Label cords accordingly and keep them with their specific piece of equipment. Something as simple as placing peripheral computer equipment (such as cables, keyboard, and mouse), in a bag and attaching it to the computer with packing tape will eliminate headaches later when reinstalling the system. Loss of peripheral equipment will mean a loss of productivity. Also, you’ll probably want to make arrangements for a dedicated power source at your new location for key employees to use on moving day. Planning ahead before moving will drastically reduce risk as well as headaches. Forvan Technology Services Inc. specializes in helping businesses create a technology plan and move effectively. We would be pleased to discuss our services to see if you can benefit from our knowledge and support. For more information please contact us today, for a FREE consultation. Keeping a detailed list of your hardware and software is becoming increasingly important. The more computers and peripherals a company has, the more it has to lose. Theft of laptops, external drives, and even software has been widespread in the corporate world. It’s important to track your inventory and create a detailed list of your computer assets, so that you know exactly who has what! In the event of a fire many companies would not be prepared to give a detailed hardware and software list to their insurer. Often items are overlooked when filing a claim and those missing items can cost you a great deal of money to replace. But hardware is just one consideration, with the tightening up of software licences; software compliance is becoming an important issue for many companies. And continually used products, such as Windows and Office, now have built in communication features that can detect piracy and with fines for piracy in the thousands of dollars, it’s vital to keep track of your software inventory to prove compliance. Software licences can be a substantial investment, so when it comes time to purchase additional licenses or move from one major software package to another, you’ll need to be aware of the distinctions between license types and the transferability of those licenses from one user or system to another. On a regular basis, you should catalogue your software and hardware. Advanced preparation and a detailed inventory list will make sure that you can proactively evaluate your software and hardware needs and prove compliance should anything be challenged. Forvan Technology Services Inc will be pleased to help you conduct an inventory review and establish a system that can easily monitor and track the software and hardware you have. Please contact us today for more information.